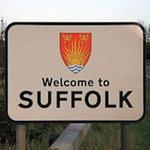 Onehouse resident since the 1980s but very much a Suffolk lad. My love of local history means that I just seem to collect stories and facts about Suffolk villages over any period of time. The perfect venue for all this research is in taking others round on guided tours.